When you start to plan a project where do you start? Do you open MS Project and start entering tasks? Do you start building a backlog and apply your favorite Agile planning techniques? As I mentioned in my Best Scrum-ban-plan Board post, I have been using that board a lot for high level project planning and scheduling. Last week I’ve been working with our Cinematics Product Owner who is a visual thinker by nature. By working together on this board, we created a visual representation of his production schedule. Throughout the whole process we wondered how we could do this any other way. So, I thought I would share a few tips on creating a visual project plan. A large, visual planning board makes it easy to collaborate with others as you build the plan. You should be able to literally step back to look at it from a different perspective. So, make sure you set up the board on a large whiteboard or wall in an area where you can work with a small group of people. If the project board is in a common space where the whole team can easily see it, even better. The more the team sees the thinking behind a plan and sees it evolve, the better they will understand it. Sticky notes are your best tool when building an initial plan. As you think of different strategies to do the work, it’s very easy to move the notes around and see the impact on the schedule. Invest in different colors and sizes – anything to better help visualize the work that needs to be done. Depending on the surface you are working on, have a number of different markers on hand to scribble on the chart – link dependencies, highlight time-frames, circle groups of work. If you are working on a painted wall, invest in additional stickers or labels to put on your sticky notes. At the beginning of the project, getting into the details can be overwhelming. Each sticky note should represent a large block of work, not an individual task. 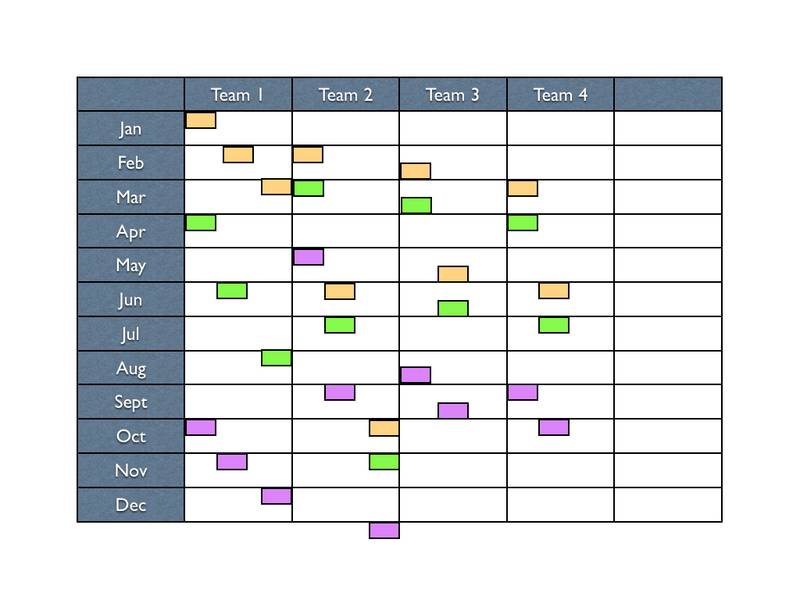 In the illustration below, each color also represents a particular type of work or phase in development, each representing 1 to 2 months of work for the team. To create the rough plan, place each block at the beginning or the middle of each month. That is the maximum precision needed at this point. We are only trying to visualize the plan, not calculate precise dates. As you can see in the illustration above, different strategies have been modeled for Teams 1, 2 and 3/4. Team 1 is doing their work in classic “waterfall” style. Team 2 is more of an Agile model – completing a feature before moving onto the next feature. Teams 3 and 4 are working in a hybrid model – getting each feature to an Alpha state, then polishing them at the end. Which strategy will work depends on what is needed for the project. For example, if all the features need to be finished the green block of work by October 1, the strategy for Team 2 is not going to work. Note: Team 2’s strategy has nothing to do with not being able to finish the work by the end of the year. The amount of work is exactly the same as Team 1, but they are starting a month later. No matter how you lay out your scheduling board, it must always represent three important pieces of information: time, work, and people. What the teams or sub-teams look like must also be one of the “Lego” blocks. In the example above, the team compositions would be identical, just like what each block of work represents. Never, ever fill the team’s capacity more than 80%. At the early stages of a project, I would even recommend to not plan more than 70% of the team’s capacity since the work is often underestimated. Even if the amount of work is well understood, keeping 20% of the capacity unbooked gives the project and the team some breathing room for innovation, responding to change or unplanned events. In the illustration, Team 1 and Team 2 are overbooked if the project is supposed to be completed by the end of the year. Teams 3 and 4 are about right. Even if Teams 3 and 4 help out Teams 1 and 2 to get their work done earlier, it still means that the project’s capacity is filled more than 80%. That is a signal to take a closer look at the scope, the timeline or to hire more people. Once you have a version of the project board that seems reasonable, enter it into your favorite project management software and do all the calculations. If the result is an end date that doesn’t work, use the board to model a different strategy. Once you are happy with the plan, the project board is also an excellent tool to explain the plan to the team. When you start to plan a project how do you start? Please share your tips in the comments. ← Yay! Bloggiesta Is Back! Thanks for the suggestion. It’s something I’m looking at. When I find one I really like, I’ll make the switch. You can access my contact form from the top menu on my blog. I just want to tell you that I am newbie to blogs and honestly enjoyed this website. Probably I’m likely to bookmark your blog . You certainly have wonderful well written articles. Cheers for sharing with us your website.